We are officially in spring. However, the temperature and wind chill does not adorn the spring that much. Last week one day, when the temperature went till the 60s, rose high hopes of spring. Here I'm all game for, spring the wonderful weather, beautiful blooms and to match with it is a feathery soft outfit. Yes, I already did wear Indian spring outfit. Pastels are always in for Spring and I love the feminine and that soft vibe every time you wear it. 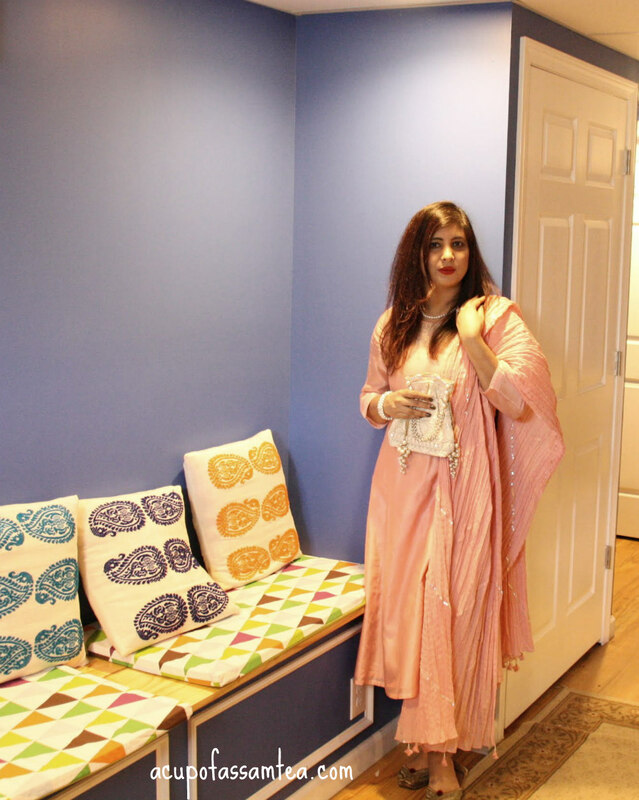 Wore a pastel Kurta and pant set with a tad bit of silver embroidery on it. The fabric of the outfit is chanderi a handwoven feathery soft fabric and is known for it's flowy and easy to wear quality. 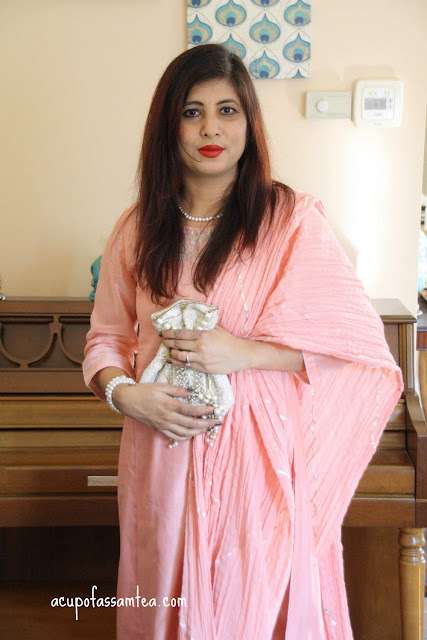 You can see another chanderi outfit here. Teamed it up with a basic pearl strand, a silver mojri (flat shoes), a pearl-adorned off white potli and bright lips. As the whole outfit has a mild vibe the bright lipstick plays a great role. How do you like it? What is your favorite spring trend? Have a wonderful weekend. You look gorgeous as always,and I love the decor !! I just love this outfit. What beautiful colors. You look amazing in it. The color looks lovely on you. Beautiful outfit friend! Wow you look so beautiful in that. The pink color suites you so nicely. Thanks for sharing! Loving the outfit so pretty and the colour does scream spring. I love that shade of pink. It looks so pretty on you. So pretty, I am loving that pastel pink! I can't wait for the weather to warm up here as well. What a pretty color on you! I love the fabric -- it's light and drapes nicely. Just perfect for warmer weather! This color looks great on you. Moreover, this look good too, but it wouldn't suit me i have a dark complexion. I love your spring outfit especially the colour that looks perfect for spring. You're looking so graceful. That outfit is really cute. It looks like it would be really comfy too! your dress looks really nice. Love that pastel pink color. You look so pretty and that dress is beautiful!